My name is John Crawford. I like in Saint John, New Brunswick, Canada. This story is something I tried and it worked for me - also, it's a "thank you" to my friend, Kevin Rogers, for all he's done for me over the years. The photo (taken by me) of Lily was taken on Shepody Hunting Preserve on November 20, 2005. It's a 5.5 lb pheasant in a 27 lb springer's mouth. 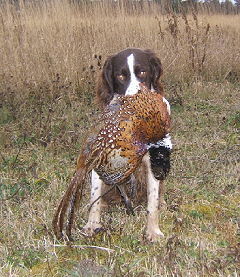 As you can see, she's not much bigger than the bird, but she's tough as nails and fearless... everything a gundog should be. I hope this gets published, but if not, at least I've said my piece. Kevin is one of the best amateur trainers I've seen - with a real dog sense to him. I think when he retires from his job, you will see him on the trial circuit doing very well. About fifteen years ago, while helping my brother-in-law with his cub pack on a weekend camp out, I brought along my then twelve month old female springer, Porchea. I met one of the Cub Scout's fathers, Kevin Rogers, who was helping, as well. He had just happened to bring along his five or six month old male springer, Charlie. Charlie would go on to become one of those dogs that have that little extra something special that make them irreplacable and unforgetable. He is dearly missed by all that knew him. Over the years, Kevin and I have become friends, hunting buddies and training partners. I lost my Porchea at the age of almost fourteen to a twisted stomach and failing kidneys. She was gone and I found myself without my hunting dog. I had always been a meat hunter without much interest in the trial end of things, but while searching for a new pup, I found myself in touch with the Maine Spaniel Field Trial Club - and the fantastic group of people there. I was going to get a pup from one of the breeders there, but when the magic day came, only one pup whelped. When you're not first on the list... well, you do the math! So I found myself searching for a pup, again. That's when I called Frank O'Grady of Springville Springers in Ontario, Canada. Long story short - on May 17, 2005, my pup, Springville Late Night Flight - a.k.a. "Lily", arrived at the Saint John, New Brunswick Airport at 11:30PM... hence the name on the papers. It was then that my brain warped back in time and started to remember all the training that was to come, but more importantly, all the mistakes that were definitely to come! So then I thought, "What is the same when you train a pup?" Easy answer... it's you and the pup. We all know how easy it is to skip a step or move on to something new before you are ready to.�Since I don't trust myself in the quest to produce a great hunting dog to stay the course on my own, I asked Kevin if he would act as my conscience. I would do my training through the week or weekends and when I thought that I was ready to move on, Kevin would come out to the field and do an impartial third party assessment of Lily. If Kevin said "yes", we moved on. If Kevin said "no", it was back to the drawing board. I don't know if anybody has tried this method of training before, but it seems to work for me. I think that most people will consider something in their heads, assess it and move on. But with someone else whose opinion you respect and appreciate speaks, you tend to step back and say he (or she) could be right.